Now, your beer snobs will tell you that Mahou is just a basic pilsner and will use pejoratives like “inoffensive – bland – gassy – insipid” etc., but that’s because beer snobs are fat, North European losers who only mix with other people at CAMRA conventions. To really appreciate the brilliance of Mahou you need to drink it in ice cold cans on a typical sunny Madrid day with your mates. Then its true genius comes out, because it goes well with tapas, friends and lots of talk, which as any self respecting Spaniard will tell you is the whole point of life. I love Mahou and Mahou loves me. It never gets me horribly drunk but it does get me lovely and tipsy. I can drink it all day and still party all night. It’s refreshing, has a hint of maltiness both at beginning and end notes, it’s available everywhere and IT’S GOT 5 BLOODY STARS ON THE TIN, so there. 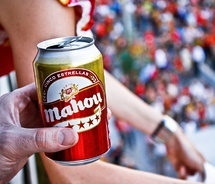 And as an added benefit, by drinking Mahou you get automatic membership into the cult of madrilenismo. In the city, Mahou has but one competitor. Yes, you can find the odd San Miguel and sometimes people will drink a Corona or two, maybe an Amstel or Heineken, but the only other beer with any wide distribution is Cruzcampo. 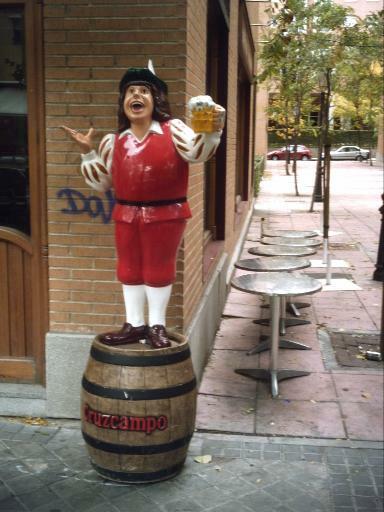 Below is a picture of the Cruzcampo mascot. He’s called Gambrinus. A pilsner at 5% abv, Cruzcampo comes from Seville and isn’t bad at all. I drink it when there isn’t any Mahou, and as there is almost always Mahou, that means I drink it rarely. But it is Spain’s biggest selling beer and like I say, it isn’t bad at all, especially when sold as draught. This entry was posted in food, madrid, spain, travel and tagged 5 estrellas, beer, cans, cruzcampo, drinking, madrid, mahou, pilsner, shandy. Bookmark the permalink.